Losing weight and getting stronger is becoming increasingly important to me as Gummybear is learning to walk. In a few short weeks she'll be able to walk on her own and in another couple of weeks she'll be running. I plan on taking Jellybean and Gummybear out to the park much more frequently and I'm going to need to lose some weight, get stronger, and gain a little stamina so I can keep up with them. Cuz let's face it, kids are Energizer bunnies. They just keep going and going and going. Because I have almost no time in between working, taking care of the kids, and trying to do some household chores (I've already said I'm not a KIT mom), I can devote 10 minutes or less each day to working out. It's sad, but it's only temporary. For the past 3 weeks I've been doing 5-7 minute workouts, focusing on strengthening and toning my arms. Here's one set of them. Okay, okay, you caught me. I'm totally making up the exercise names but I think the pictures give you a clear idea of what the exercise is. I think my names are better that what the video calls these exercises: Dumb 1, Dumb 2, Dumb 3, etc. And, by the way, the workouts are from Jung Dayeon's FigureRobics Figure Dumb workout video. I use 8-pound dumbells and I picked the exercises I wanted to do. I don't follow her 4 sets of 8 reps as in the video. 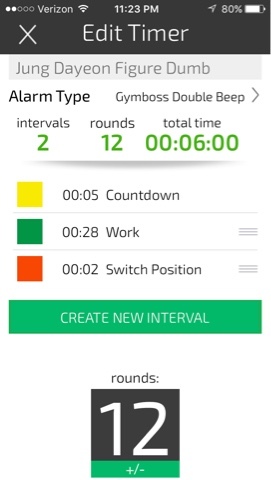 I use a Gymboss (free from the App Store) timer and do 28 seconds of each exercise AMRAP (as many reps as possible) style. So, the above is what the Gymboss timer looks like. I've got this set to 12 rounds. This way, I go through all 6 exercises and do it again before calling it. Boom! You just did a 6 minute workout! Within the first week of doing this I noticed a tiny bit of definition in my shoulders and by the third week I've noticed increased strength. I'm still 35 pounds overweight but I feel really really good knowing I'm that much stronger now than I was at the beginning. Have fun with your workouts!